This for all, who are having difficulty in blogging to get their Google AdSense account approved by Google. Also ideal for new bloggers that have been rejected by the famous AdSense repeatably. From experience, when your AdSense application gets rejected; it’s a tough and disappointing, as your hopes to start making money online gets dashed at times many newbies bloggers quit the blogging world. Know this now, Google AdSense is not the end of your blogging dreams, if you don’t have any approved AdSense account to your name, you can still make good money online using your blog. What Should I do When I’m Rejected By AdSense? Relax and be Calm: AdSense, as we know it, is an advertiser and publishers marriage network who are connected together, AdSense is where Google advertisers “Adwords” get their demand come to live, through publishers ( including Bloggers etc). But to maintain the quality of the system by displaying adverts to quality publishers, they try to accept only quality sites with quality web traffic. if your adsense application get’s rejected, that means your blog is still missing something, Google wants to see, so you need to work and make it better. That’s why, AdSense now implements 6 month old blog policy before getting your application approved, as 6 months is good enough for a Blog to improve and look professional. 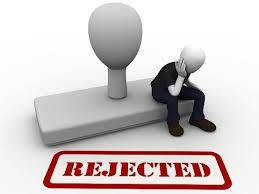 Don’t let your Application rejection kill your motivation for blogging or weigh you down. Don’t Reapply for Adsense Instantly: Note that when AdSense reject your application, they indicate reasons for doing so like “Insufficient content” etc. With the above reasons, you can actually look into what went wrong and how to fix it. Most new blogs get the Insufficient content, message, which means that your post must not be less than 300 words. Your Blog content must have quality and look rich to attract your readers back after first visit. And if yours was “copyrighted material”, which means, only one thing “plagiarism”. To resolve this, remove all articles copied from other blogs without a link back to the source of the post. also make sure you rewrite all the articles post If your passionate about copying. Get Quality Blog Design: Another popular reason for rejection is “difficult site navigation”. When you receive the difficult site navigation, which means your blog design is very poor and needs a professional touch, by clicking here at a very good price. You can also solve this by using a professional wordress theme from evanto marketplace to build your blog and if you are on blogspot, use a blogspot theme which looks simple and professional. Build More Quality Traffic: When it comes to online media, traffic is Queen, without traffic no one will visit your site, nor reading your post. Make sure your blog traffic come from various sources including search engine, email media and social. Do you know you can get quality traffic from Facebook for just 1500, you can get help from RaftkeyMedia for a professional touch on SEO, Traffic before reapplying back for AdSense. Also ensue to read all ADSense terms and conditions carefully and you might just figure out the reason for “your blog doesn’t meet their quality guidelines and fulfill all the criteria” and how to fix it in time. Get Ready to Reapply for Adsense: if you’ve followed the above steps, you can then re-submit your application for adsense and watch the magic that follows. What if I Tried The Above And I’m Still Not Accepted? Register for a new gmail account that is not associated with your old Adsense account, you also need to order for your free Payoneer Master card, with this UK Google Adsense easily approved like magic, as Payoneer Master card, you can withdraw your money on any local ATM point. How Can I get Payoneer Master Card? To get your Payoneer Master card, which is absolutely free of charge and gets delivered to your location in less than 3 weeks. Once you’ve gotten your personalized Payoneer Master card, get ready get your UK google Adsense account approved. See more details to order for Payoneer Master Card here. Konga finally Shuts down Pay-On-Delivery Option. same thing happening to me here, how long should i wait?? Yes, 6 months after starting ur blog. I think the six months package apply for Asian users. because you can have your account approved before six months period. Only if you comply with all their terms and policies and also having good ORGANIC traffic.